According to the Journal of American Medicine, "Goat's milk is the most complete food known." It contains vitamins, minerals, electrolytes, trace elements, enzymes, protein, and fatty acids that are utilized by your body with ease. With 48% of children under the age of 5 suffering from malnutrition in India, owning a goat can go a long way to providing adequate nutrition for a family. In addition to providing nourishment surplus goat milk or cheese can be sold by families at their local market to generate income. Goats are one of the easiest animals for a family with few resources. They survive in challenging environments, and are renowned for not being picky eaters. They are easy to breed, and have the ability to produce offspring twice a year giving families the opportunity to raise a herd in a relatively short amount of time. Extra goats can be sold or kept to provide more milk. 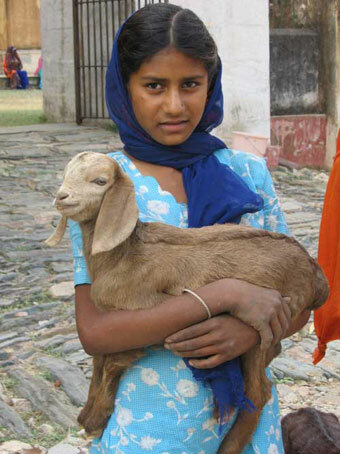 For a family in southern Rajasthan, a goat is a gift that is extremely useful. 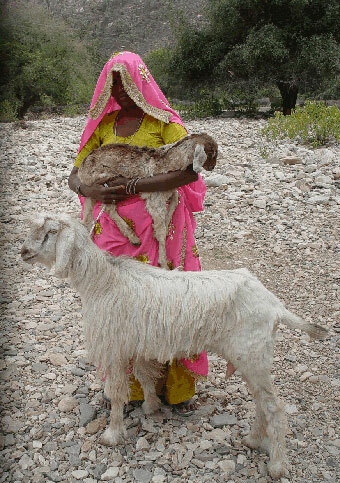 Relief Riders International has gifted goats to nearly 400 families throughout the Thar Desert of Rajasthan. Our Give a Goat program is a very powerful and personal experience that is often considered by riders as one of the memorable highlights of the trip. 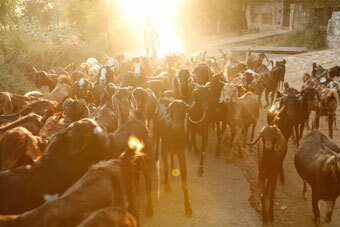 On each Relief Ride we run our Give a Goat program in two separate villages. We are usually able to provide 30-60 goats depending on the number of riders or previous donations received for each trip. A few months before the Relief Riders arrive in the village our Needs Assessment Team talks to the local school principal asking him or her to identify the families most in need of assistance. Anyone living on less than $1.25 a day is considered to be existing below the International poverty level. 42% of Indians are living on less than $1.25 a day. 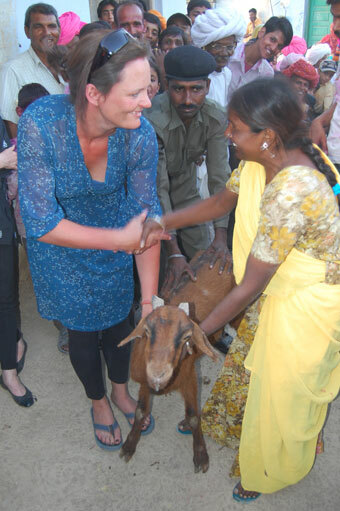 Our school principals however, use the Indian National Poverty level to select families eligible to receive goats. The Indian government considers those living on less than $0.25 a day to be below the poverty line - these are the families we help with our Give a Goat program. The villages we visit are located in very rural areas far from the mainstream tourist circuit. These villages are rarely visited by anyone from outside the region, but are tightly woven together by an efficient word-of-mouth communications system. The news of something as unusual of 12 foreigners traveling on horseback and a large group of goats arriving in the village spreads quickly. We are always greeted by a large curious and welcoming crowd. Our riders are always delighted and very moved as they take turns personally handing over each goat to each its new owner. RRI's Give a Goat program is just one of a few powerful and transformative programs on our breathtaking adventure through the Thar Desert of Rajasthan. If you would like to participate in personally giving goats to below poverty level families in Rajasthan we invite you to join us - we still have a couple of spaces left on our January and February 2011 Relief Rides. Unable to join us in India this winter and would like to help? You can purchase a goat for $75 which we will deliver for you. Your purchase is tax-deductible, for more information please visit our Give a Goat page. We would like to wish all of you a wonderful holiday season and a Happy New Year!